5/18 Cup of Coffee: Friday's slate of games were marked by late-inning heroics, as Pawtucket and Greenville went home with walk-off wins. Portland lost its game in the ninth, while Salem, the only outlier, won in a route. The Pawtucket Red Sox beat the Gwinnett Braves (ATL) 5-4 Friday night on the strength of a Bryce Brentz (pictured) walk-off three-run home run. Trailing 4-2 entering the bottom of the ninth, PawSox leadoff hitter Jackie Bradley Jr. worked a walk. After shortstop Jose Iglesias struck out, Drew Sutton doubled, advancing Bradley to third. The stage was set for Brentz, who did not disappoint. The PawSox cleanup hitter slugged the 1-1 offering over the left field fence to cap the late-inning rally. While the PawSox pitching staff gave up four runs on the day, only two were earned. Starter Alfredo Aceves gave up one earned in five innings, and reliever Ryan Rowland-Smith surrendered the other earned run in three innings of relief. While they were celebrating late-inning success in Pawtucket, Portland was second-guessing itself, as the Sea Dogs dropped Friday's contest to the Binghamton Mets (NYM), 6-3, after giving up three runs in the top of the ninth. Sea Dogs starter Matt Barnes surrendered only three runs in six innings of work, walking only one and striking out seven. When he left after the sixth inning, the game was tied. However, that wouldn't last: Two Sea Dogs throwing errors in the ninth led to three runs and a Binghamton victory. Leading Portland's offensive attack was leadoff man Peter Hissey, who picked up two hits, both singles, a walk and a stolen base in five plate appearances. The only two RBI on the day for Portland came off the bat of Michael Almanzar, who crushed his seventh home run of the season in the sixth inning. Salem's offense proved too much for the Frederick Keys (BAL) Friday night, as they amassed 15 hits on their way to a 10-2 rout. Eight of the 15 Salem hits went for extra bases, including a three-run blast from catcher Carson Blair, his first home run on the year. Garin Cecchini continued his torrid pace this season, going 3 for 4 with a double, two runs scored and two RBI. Cecchini, who leads the Carolina League in hitting and OPS, is hitting .436 with nine RBI in his last 10 games. Leadoff hitter Sean Coyle also had an impressive night at the plate, going 3 for 5 with a double and a run scored. Salem starter Kyle Stroup pitched strongly with the comfy lead, giving up only one run in 5 1/3 innings. After falling behind 4-0 after four innings, the Drive stormed back to steal a game from the Charleston RiverDogs (NYY) by a score of 7-6 in 11 innings. The game was won when third baseman Bryan Johns singled with two outs to score Dreily Guerrero from second base. Although it took the Drive until the 11th inning to deliver the final blow, they threatened to score many times in the game, resulting in a total of 17 hits and 14 men left on base. Amassing four of those hits was left fielder Drew Turocy, who also picked up his third triple of the season. First baseman Tim Roberson, second baseman Mookie Betts and catcher Jayson Hernandez each picked up three hits in the game. Starting on the mound for the Drive was Pat Light, who surrendered five earned runs in four innings. Light gave up seven hits and four walks, raising his season ERA to 8.28. 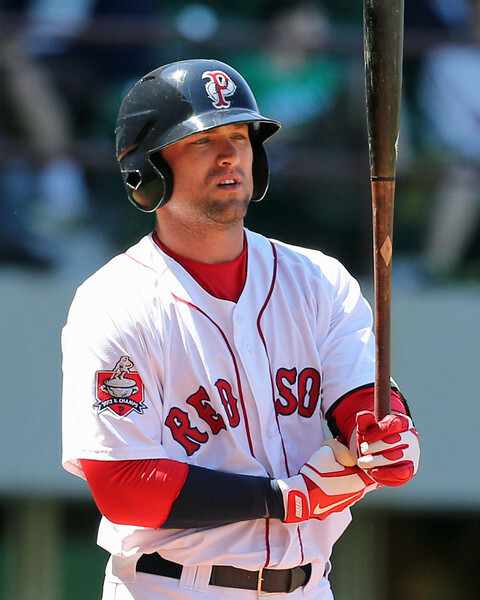 Player of the Day: While others may have had more impressive stat lines, Bryce Brentz's late-inning heroics on Friday earned both the PawSox a win and the left fielder player of the day honors. The three-run blast was Brentz's seventh of the season. So far this year, he has produced a stat line of .280/.331/.510 in 143 at-bats. Photo Credit: Bryce Brentz by Kelly O'Connor. Luke Lavoie is a Staff Writer for SoxProspects.com. Follow him on Twitter @LukeALavoie.